ILUSM | What Does ILUSM Mean? ILUSM means "I Love You So Much." ILUSM is often used as a show of appreciation to an act of kindness by a loved one. Its purpose is to express intense affection. 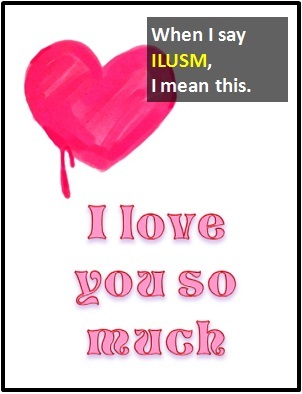 Be aware that, just like when using the other abbreviations meaning "I love you," ILUSM can be interpreted as less heartfelt than saying "I love you" explicitly or typing the words in full. Through its overuse, ILUSM should not always be taken literally. It is sometimes used just to show affection, rather than actual love. In other words, it can be used between friends or between family members. ILUSM means "I love you so much." Person A: You proofread my dissertation already? ILUSM! Person A: Thanks for driving me to the hospital tonight. Person B: Anything for you. ILUSM. ILUSM is an initialism abbreviation. Technically, this means it is pronounced using its individual letters (i.e., Aye Ell Yoo Ess Em), but as this is harder to say than "I love you so much," it is not often uttered using its letters. In other words, the abbreviation ILY is for efficiency in writing and not efficiency in speech.